Is Your Website Built To Rank? Have you hired an SEO firm but your local business is still not ranked on the 1st Page of Google? Search engine optimization is not necessarily easy or cheap. But without this proper coding on your website, it can be downright impossible. Follow the steps below and check your own website. There is a reason why we are able to build a new lead generation website and rank it in just 2 weeks. What is this “coding” you speak of? Google, Yahoo, and Bing sponsored an open source community called Schema.org to create a new vocabulary to be used in the HTML code of websites. The purpose of this vocabulary (schema markup) was to make it easier for the search engines’ robots to identify the useful data contained on a webpage. You have certainly seen the benefits of Schema markup if you search for a restaurant and there is a 5-star review on the Google listing. Or how about if you have searched for a local movie theater and seen Star Ratings next to the movie showtimes? This information is displayed right there in the Search Results because the websites have served the search engines this structured data. Big corporations with website departments have installed this code on their website, and many of those corporations have been instrumental in working with the search engines to define this new code. However, 98% of small businesses still do not utilize Schema.org markup. Schema.org has defined many attributes specifically for small businesses. Everything from the type of business to the exact geographical coordinates of your location to your hours of operation. There is even code for you to tell the search engines links to other online directories. But the coding has to be installed in a very specific manner. If you have hired an SEO firm AND your website is not on the 1st page of Google AND the code below has not been added to your website . . . then your SEO firm is either incompetent or lazy. H1 headings, meta descriptions, and meta tags are no longer the SEO must-haves that Google, Yahoo, and Bing rely on. 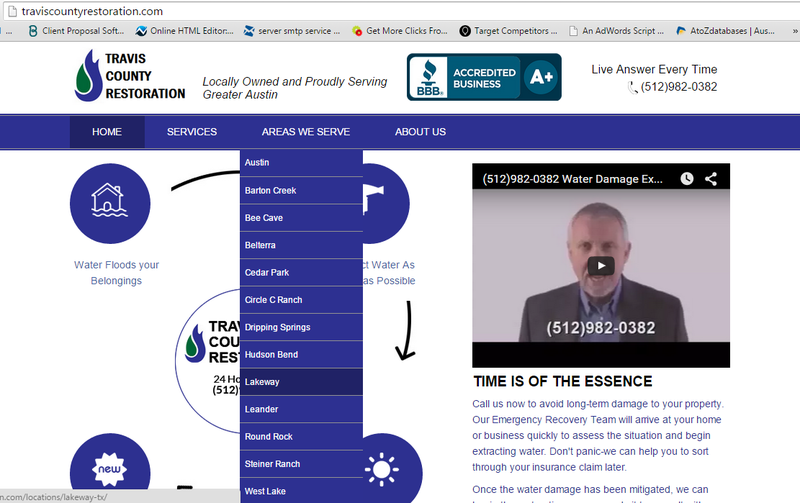 We are going to use one of our lead generation sites as an example, Travis County Restoration. Our firm built this website with the latest techniques in schema markup and optimized the website’s structure to rank in the Austin, Texas, metro area. We did ZERO off-page link building to this website other than the YouTube videos that are embedded on the landing pages. Within 2 weeks of launching this site, it was on the 2nd page of Google for our primary suburb. Within 4 weeks it was at the bottom of the first page for our primary suburb and generated its first phone call. We get $200 per phone call. 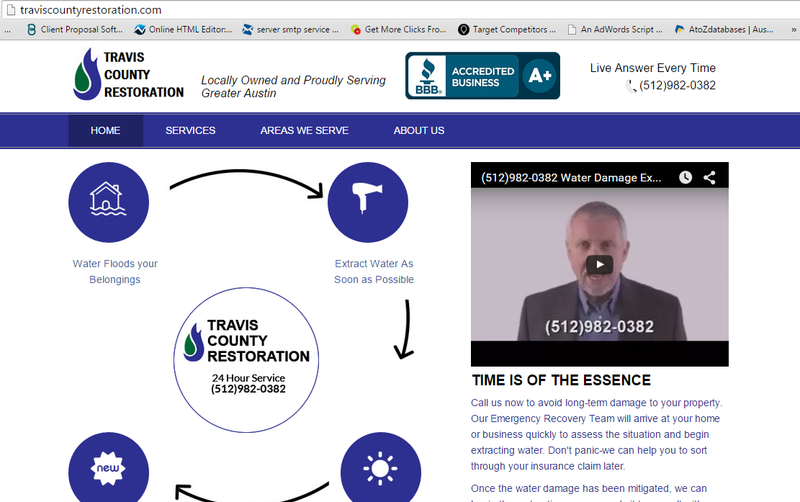 Water damage restoration has a high customer value. We first go to the website. Here we have started at the Home Page. It is important to remember that Google does not rank websites. Google ranks webpages. The reason you often see just the main website url in the Google search results is because Google cannot find another webpage that is a better result for that search query. Therefore, if you are trying to rank your website in multiple towns, it is important to have a different landing page for each town. An outdated technique is to create a separate page on your website for every town and every zip code and every neighborhood. This is usually poorly executed and can now be penalized by Google. 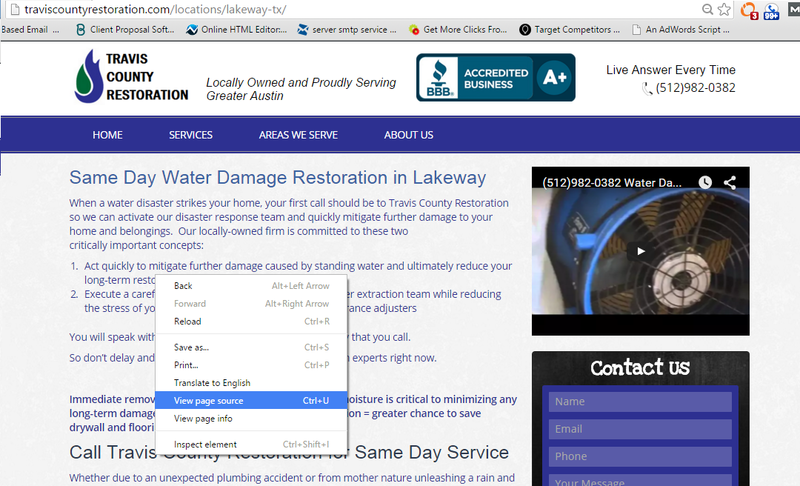 WE ARE A WATER DAMAGE RESTORATION COMPANY IS LAKEWAY TEXAS! But the most important thing we will check here is to Right Click anywhere on the page and then go to ‘View page source’. This will show you the guts of your webpage. The HTML code that is creating all this magic. This code is what the search engine robots see. And this is all they see. So the better we follow their rules, the better chance we will have to be rewarded with a favorable ranking. Now do a “Find” on this page. If you are using a different internet browser, then this HTML source code may have opened in a Text File. Either way, you should be able to press CTRL + F to open a search window and search for the term “schema”. Refer to the image below for what you should expect to see. 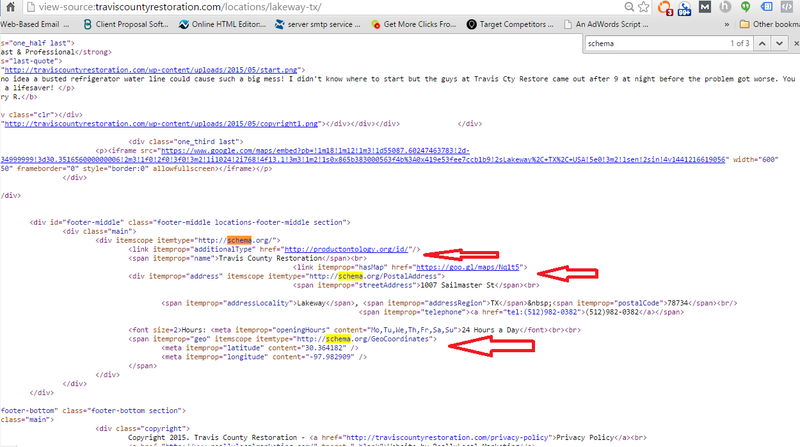 You can see that his website has “Schema.org” code covering the page. This bit of code has identified for the search engines the type of business, street address, city, zip code, geographical coordinates, hours of operation, telephone number, and we have even attached a link to a Google map of the exact location. Does your HTML code share some of this schema markup? If your website is lacking this code, call us today. We are a business-building, process-driven Lead Generation Firm focused on scalable growth and who happens to execute SEO as part of a comprehensive leadgen strategy. We provide SEO-specific services for a few select clients (and only in those markets where we do not currently operate our own lead generation website). For more information about how our team can support real-world business growth through online strategies, feel out the short contact form below and someone from our team will be in contact with you within 24 hours (usually 4 hours). Are Your Marketing Mistakes Haunting You?